In the Northeast we’re on the brink of Farmer’s Market heaven: in just one more week almost all of our local Farmers Markets will be in full swing. With that explosion comes the first harvest of many delicious ingredients. Some of the first vegetables you see will be seeing are greens: spring raab, spinach, bok choy, mizuna, arugula and Swiss chard. What exactly is Swiss Chard? A ripply large flat green leaf that has multi-colored stems. 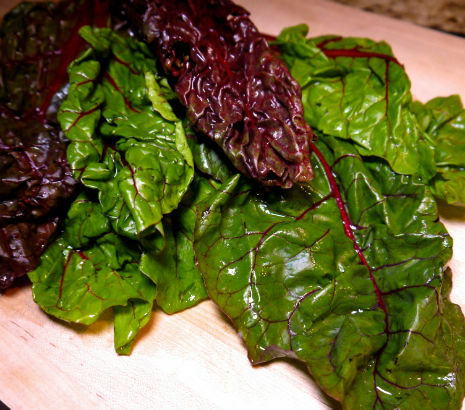 It’s sometimes called Red Chard, Rainbow Chard or simply Chard. 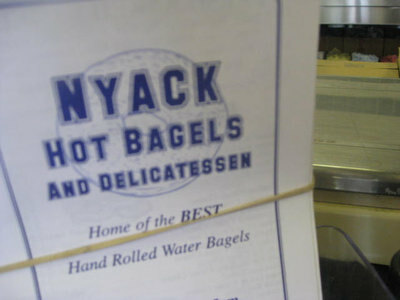 What we do know for certain is that its considered to be a healthy power food. Chard, a Mediterranen ingredient, has been cultivated for thousands of years. It’s a member of the “chenopod” family which also claims beets, spinach and even quinoa as members. Chard is has a mild flavor, similar to spinach and is high in Vitamins K, A and C. Similar to spinach preparing chard is quick and easy. You can eat it raw, steamed or with a quick sauté. Last year I wrote about Rainbow Chard from Amawalk Farm, that I picked up at John Jay Farm Market. Rainbow chard is stunning with it’s multi-colored stems. This past week at the Chappaqua Farmers Market I found a gorgeous bunch of red chard, also stunning in color and flavor, which got my creative juices flowing. People frequently ask me how I come up with my recipe ideas, and quite honestly many times I’m using things in my pantry or ‘fridge to create a dish. That is basically what happened this weekend. With just a little leftover rice, and a few vegetables that I grilled, I came up with a hearty dish that can easily be part of your Memorial Day BBQ. 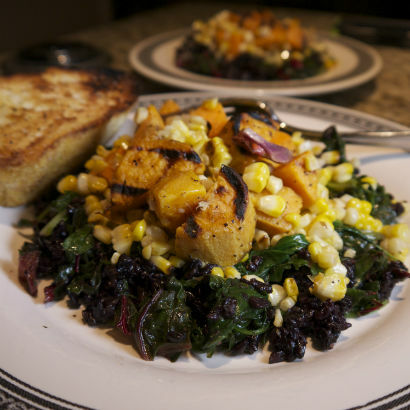 The best part of this dish is you can make whatever you desire. 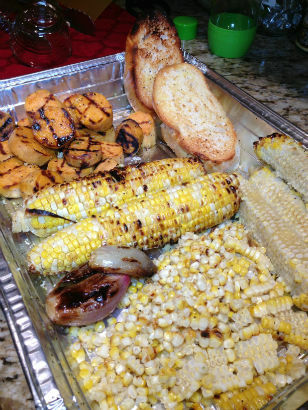 I used sweet potatoes, corn, and shallots; but feel free to experiment. 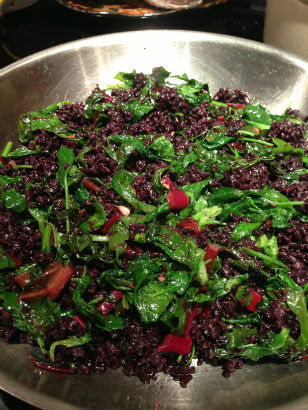 Click this recipe link for Sautéed Swiss Chard with Black Rice and Grilled Vegetables. Simply use the recipe as a guideline and let your imagination lead the way. 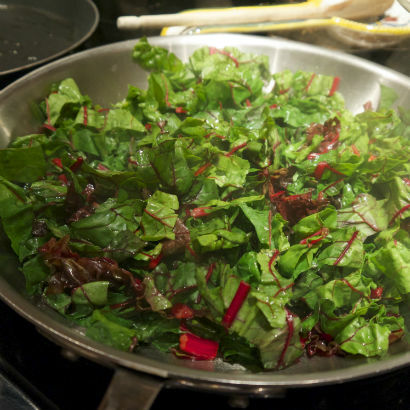 Just be certain to use chard as your leafy green. It’s delicious, nutritious, and simple to prepare. Love Swiss chard! Recipe looks delicious. Thanks for sharing! Thanks Chrissy! Let me know how yours turns out!